The safe and reliable charging of electric vehicles is also directly linked to electrical safety in the building installation and the charging stations. Electrical safety both in the vehicle itself and in the charging infrastructure is of key importance, especially for AC charging. AC charging stations can often be found at home, in hotels or at the workplace, since AC charging utilises conventional low voltage and the required charging infrastructure can be kept relatively simple. If the electric vehicle is connected to a conventional socket-outlet (mode 2) or an AC charging station (mode 3) to charge the battery, the protective measures defined by the relevant standards must be complied with. A major element of the infrastructure is the use of type A residual current devices (RCD). The required charging infrastructure for AC charging from the socket-outlet is simply the charging cable. This special cable must feature an integrated monitoring system and the vehicle must provide internal charging electronics. Both the charging station and the mobile protective device (IC-CPD) must switch off if an alternating or pulsating fault current ≥ 30 mA or a direct fault current ≥ 6 mA occurs. 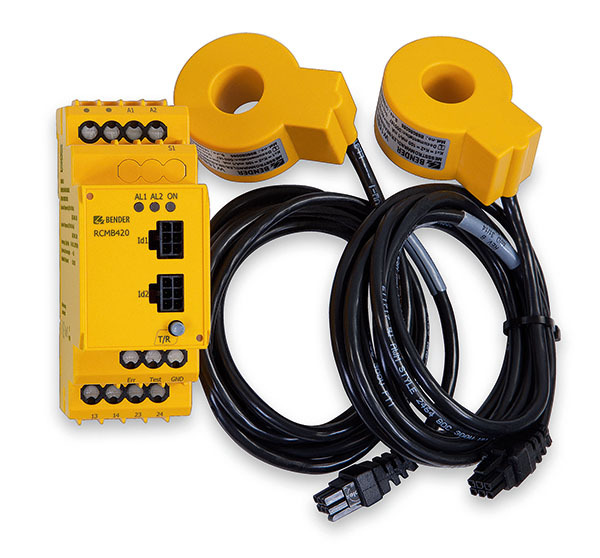 Bender offers residual current monitoring sensors to mode 2 charging cable manufacturers for use in IC-CPDs. An AC/DC sensitive residual current monitoring device must be used for fault current monitoring in AC charging stations. If, in the event of an insulation fault, a direct fault current greater than DC ≥ 6 mA occurs in the charging current circuit, direct fault current detection or a type B residual current device (RCD) will be required. The RCMB420EC or RCMB104 from Bender provide a solution that allows detecting and evaluating these direct fault currents. Disconnection measures prevent malfunction of the type A RCD.